Formula for Murder by Judith Mehl, a Mysterious Review. 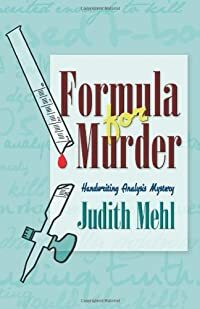 Review: Kat Everitt, a part-time media relations officer at a small college in the Poconos, uses her expertise in handwriting analysis to search for the killer of a chemistry professor in Formula for Murder, the first mystery in this series by Judith Mehl. As Kat passed the laboratory of Charles Abbott one evening, she heard him arguing with someone but paid it no heed. He was always in a foul mood. She had once analyzed his handwriting and labeled him as secretive and anti-social. But now he is dead, a glass rod protruding from his stomach. At the small Mountain View University where she works, there aren't many suspects but enough that Kat thought she could narrow them down using samples of their handwriting. Still, she's familiar with how a homicide investigation is run — her dad was once a cop — and she knows she needs to step carefully around the investigating office, Richard Burrows. But someone must believe she knows something because she begins to think someone is stalking her. Indeed, a professor with her general size and build is attacked at night. Could it be that Kat was the intended target? But what does she know that would cause a killer to come after her? College campuses always make for good murder mystery settings, what with any number of rivalries going on simultaneously. Faculty with staff. Faculty with students. Faculty with faculty. Kat Everitt makes for an engaging amateur sleuth and fortunately the plot isn't limited to her simply asking for a sample of everyone's handwriting, as there are other clues to help her identify the killer. This fast-paced mystery has something of a cozy feel to it, with a bit of romance and humor interlaced throughout. All in all, a pleasant start to this series. Special thanks to guest reviewer Betty of The Betz Review for contributing her review of Formula for Murder. Acknowledgment: the author provided a copy of Formula for Murder for this review.